Roads are the main source of sediment delivery to streams and can greatly reduce groundwater infiltration, if poorly constructed. In addition to chronic surface erosion. When roads concentrate runoff they also cause mass wasting that can be highly destructive. 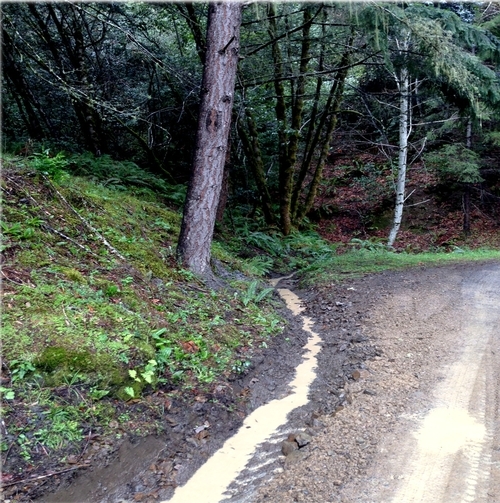 Excess sediment may also bury stream beds so deeply that they lose surface flow seasonally, a condition not uncommon in the Eel River watershed. Information on this page is from Pacific Watershed Associates Updated Handbook for Forest, Ranch and Rural Roads, 2015. 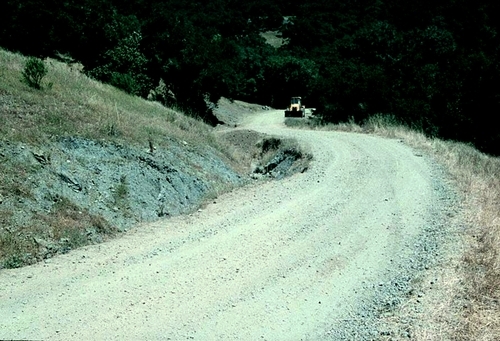 This handbook is the best source for learning how to maintain your road for minimal erosion. The Pacific Watershed Associates library has more information about reducing sediment pollution. Road maintenance like grading needs to be done in the summer. Conducting these activities in the winter promotes elevated surface erosion that is readily discharged to streams. However, winter maintenance using hand tools to keep culverts clear on a rainy night or to shore up a water bar that is being washed out can make a world of difference in terms of preventing erosion. Roads often have inboard ditches that concentrate water and can cause gully formation. Water accumulating in the ditch may also overwhelm relief culverts and cause road failure. Roads with in-board ditch design tend to route water off your property and tend to decrease groundwater infiltration. If there are stretches of road on your property where inboard ditch design cannot be avoided, be sure to put trash racks on your culvert inlets to prevent plugging. Out-sloped roads shed water into vegetated edges and promote groundwater infiltration. This road design reduces the risk of road failure and tends to need a lot less frequent maintenance than ones with ditches. Margins that match the natural topography and maintain native vegetation minimize risk of erosion. Managed road margins with infiltration maintain a more moist micro-climate and decrease likelihood of road-side wildfire. Rolling dips can be used to channel road water into vegetated depressions that serve as infiltration basins. 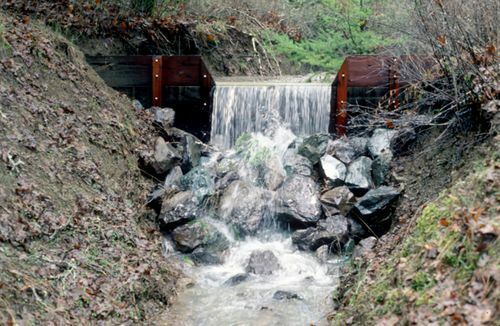 This gully erosion control technique was devised by the U.S. Forest Service and requires no heavy equipment, only hand tools to construct. The structure traps sediment and rebuilds the ground level thereby helping restore the water table to its former elevation. The filtered water coming from the gully is much cleaner and helps recovery of downstream reaches. For best effect, these should be built in a series so that the sediment and pool backed up behind one reaches the apron of the adjacent structure. Culverts draining roads may cause massive gully formation if there is no armoring or system of deflection. Gullies on hill slopes and meadows also cause a secondary problem, they drop the water table. Roads that cross perennial or seasonal streams need properly sized culverts that are installed at the appropriate grade. This hanging culvert is causing erosion and also creating a barrier to fish and Pacific lamprey passage. 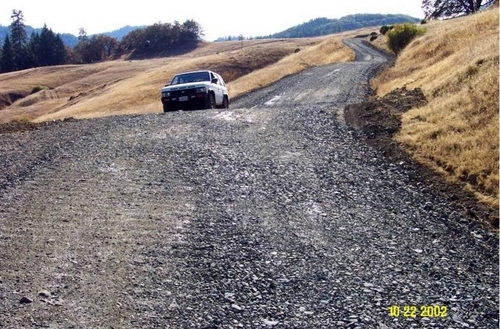 Road construction across water courses requires a California Department of Fish and Wildlife 1600 permit and to insure that each is properly engineered and installed. Culverts should be sized for large storm events (i.e. 100 yr. storm) to avoid road failure. 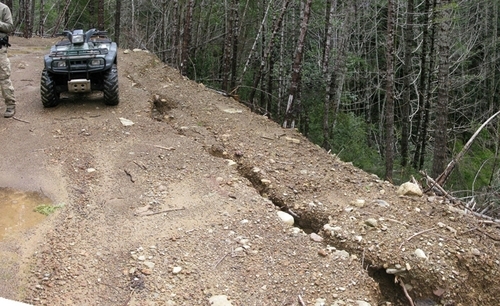 Access routes to cannabis grow sites are often steep, narrow roads or trails where the most common form of transport is a quad-runner. These vehicles tend to cause ruts where soil is compressed by traffic that can then lead to major problems with gully erosion during the rainy season. Winter best practices include placement of water bars, mulching, and seeding to prevent surface erosion and gully formation. 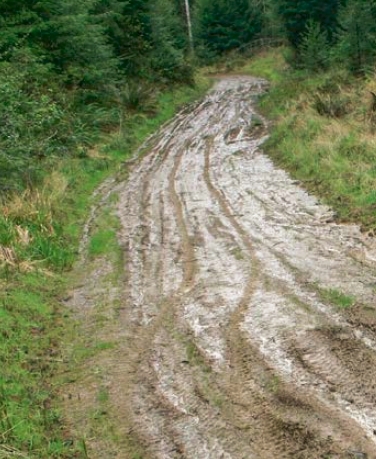 Be sure not to travel on these spur roads and trails during winter or before the ground has had time to dry out on spring. Cannabis growers sometimes clear substantial areas of ground to set up areas for cultivation, although minimizing soil disturbance should always be an objective of development. Skilled equipment operators conducting well planned work during the summer and early fall can lead to a stable farm area and a minimum of soil loss and pollution. If you have bare soil areas, plant seeds of native grasses just prior to fall rains. Straw waddles can be used to block trap potential runoff, but mulching the entire site with rice straw may be desirable. Downed fir branches can also be used to cover the bare area and reduce erosion potential, and downed limbs can be used to form check dams down-slope on the margins of the cleared area.